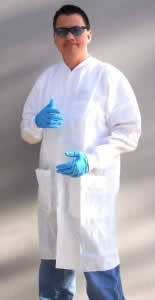 SMS Labcoats. Case of 30. White labcoat. 45gm SMS material comprised of 3 layers of polypropylene; 2 outer layers of spunbonded filaments and an inner layer of meltblown polypropylene. Snap front closure. Thigh length. 3 pockets. Knit cuffs and collar. Individually packaged in a poly bag. Made in China.